University of the Pacific's Symphonic Wind Ensemble presents The 1968 Retrospective and a fundraiser for those so severely impacted by the Camp Fire in Paradise, CA. The concert is free. Attendees are asked to bring canned food donations for the fire victims. 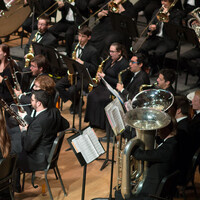 The concert repertoire was inspired partially by the Prague Spring of 1968 and the musicians will perform Karel Husa's Music for Prague 1968 under the direction of Pacific Professor Eric Hammer, director of bands. This is a concert which was originally scheduled to take place on Nov. 18 but was canceled due to unhealthy air quality at the Stockton Campus. Since the Conservatory students worked very hard to prepare this challenging repertoire, the concert will allow them to showcase the musicians, while at the same time contributing to the efforts to support the fire victims.